I haven't posted anything in a while, so I thought I'd put this one up. These went out today, both for a Kahr CW-45. I guess there's not much to say about either one except that they both turned out really nice and are very comfortable to wear. The cordovan BSP is in 8-9 oz with Angelus dye, and the black Model 1 is in 7-8 oz with Lincoln dye. The Lincoln is the smoothest black dye I've ever used - virtually zero excess pigment on the surface. So much that I don't even waste the time by buffing it. Anywho, comments and critiques are encouraged. Thanks for looking! Thanks! No, the cordovan dye is dipped full strength. I've tried the Angelus cordovan on many brands/tannages of leather and it's always a great performer. The color is really deep and rich. 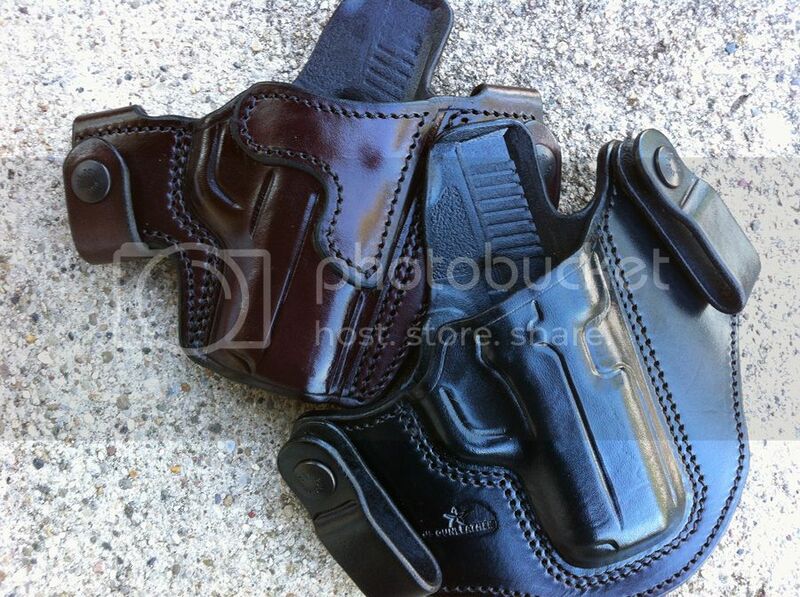 Both holsters look great, the molding, fit-up, color and finish are all outstanding! Very well done!